The release of Colorado’s Sheep & Goat and Big Game brochures brings the promise and excitement of new hunting seasons. With over-the-counter maps, hunt codes, season dates and fees, the brochures confirm that what we’ve done in the past is still available, aid us in finding new opportunities and help support a strategy to secure a license for the upcoming seasons. Most years, we dive in with purpose, flipping to the sections that we know will help us get the job done (or scrolling if you’re looking at the brochures online). I caution you – do not take that approach this year! For more than 120 years, your contributions have supported wildlife conservation, ensuring that Colorado remains home to abundant wildlife and world-class hunting. Now is your chance to look toward the future! Colorado big-game hunter. Photo by © Vic Schendel/CPW. The official leftover big game limited licenses list for deer, elk, bear and pronghorn is now available on the CPW website. These remaining limited licenses provide hunting access on specific Game Management Units (GMUs) and offer Colorado big-game hunters some great opportunities this big game hunting season. The leftover licenses go on sale Tuesday, August 7 at 9:00 a.m (MDT). NOTE: at 9:00 a.m. licenses will be available for purchase online (CPWshop.com), by phone at 1-800-244-5613 , in person at CPW offices and at license retailers (sporting goods stores, hunting and fishing supply stores, etc.). There are more than 50,000 big game hunting licenses available on the leftover list this year. For many Colorado big-game hunters, June is a time of celebration or sadness. By June 11, the 2018 big game draw results will be final. For successful applicants, the planning process will continue. Summer scouting trips will be planned, valuable shooting range time will be scheduled, and diets and exercise can all be optimized in preparation for exciting fall outdoor adventures. For those that were unsuccessful in the draw, don’t be discouraged. If you have the desire to hunt and a sense of adventure, there is a very good chance that you can acquire a license and be hunting big game in Colorado this fall. Charles Jenkins celebrates after taking this awesome pronghorn buck. After saving up my preference points and waiting 18 years to draw in unit 201, I was able to get this beautiful buck with my muzzleloader on opening morning. 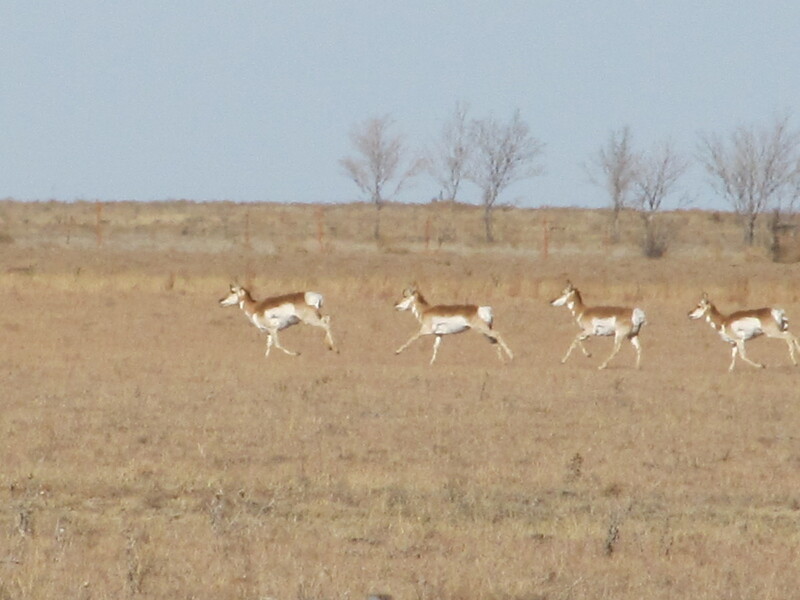 Pronghorn run across the Comanche National Grasslands in southeastern Colorado. Antelope are a unique North American native. However, it is, in fact, a mistake to call them antelope. Although many people refer to Colorado pronghorn by this name, their resemblance to the African antelope species (Old World members of the cow family) is only superficial. Interestingly, pronghorn have a DNA match closer to the giraffe than any other animal.